I can't touch type. I can type quite fast and fairly accurately, but I can't touch type and I do make mistakes. Most of my blog posts are free from errors (I hope) because I concentrate on what I'm tyoing, I check as I go along, and I correct the mistakes. I'm a natural proo-freader too so I do tend to spot most of the typos and the times when I've hit 2 kets together or in the wrong order. Occasionally it's only later, when I re-read a post, that I notice something but I will then go back and chagne it. The fact that I usually notice these things is quite useful when The Doctor has writtne a book or article, because I proof-read them for him; also, I just like what I've written to be acurate! But I do make mistakes when I'm writing or typing, Not often spelling mistakes, my spelling is pretty good, but occasionally I transpose letters or numbers, and when typing I do quite often hit the wrong key. In this post I've deliberately not gone back to correct the several mist-ypes that I've noticed along the ay, just so you can see what my blog would be like if I didn't edit as I went along! I just love the Pooh Bear quotation "My spelling is Wobbly. It's good spelling but it Wobbles, and the letters get in the wrong places." (A.A.Milne) The picture seems to go well with that and with the theme of my post - even if it isn't my spelling that's the problem! This post is part of an occasional series of confessions which will eventually become the basis of my I Have To Confess album. I didn't start touch typing until long after the high school. I hated my typing class in high school. 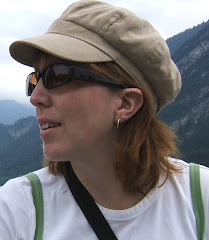 You're a much braver woman than me, I couldn't let a mistake go if I'd noticed it. Four touch typing classes at the local technical college were my reward from my parents after O Levels, though they didn't buy me a typewriter! It did come in useful for typing at university. Me too, though I wish I could touch type. It's just that I've never exerted myself to learn. I'm lightning-fast with three fingers, though, and I can't think any more quickly than that anyhow. I can't type properly either, but I manage ... and I like spell check (but only if you know how the word is spelt correctly in the first place!). I think my daughter would adore that Winnie the Pooh quote. It's very her! I loved the "I Confess" project. Will have to post mine some time. . . you're off to a great start. 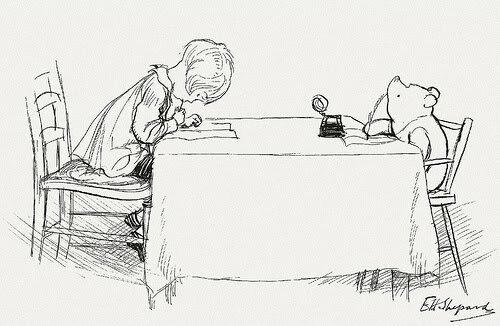 BTW: love, love, LOVE that image of Pooh and Christopher Robin writing away at the table...so sweet! I am so the same way! But I wouldn't have the nerve to post without making the corrections. My typos just glare at me! Can't wait to see your 'I have to confess' project, I have this project waiting in my 'To scrap' pile along with several other little classes! Hehehe... good post! Made me smile. Great idea! I too hate the mistakes and have to go through my posts and edit them all often several times! bet there are still errors though! AA Milne is very clever! you crack me up! love this post ~ and what a perfect quote and pic! This really had me laughing, Mel. I learned to touch type in a business class my sophomore year in high school on a manual typewriter. That kind of experience tends to stay with you. I still have to proofread everything carefully, though. It's not hard to make an error. Perfect illustration for the post!